Talk title: Keeping it in the family - our journey to create an award-winning biodynamic vineyard. 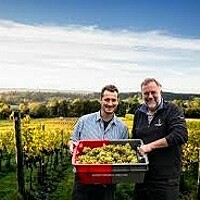 Albury is a small, family-run biodynamic vineyard located in the beautiful Surrey Hills. It produces the highest quality organic English wines, including the Silent Pool Rosé which was served on the Royal Barge to celebrate the Queen's Jubilee. It's award-winning sparkling wines are now served at some of the country's best restaurants.